SPIDER is the new SICStus Prolog IDE, based on Eclipse. 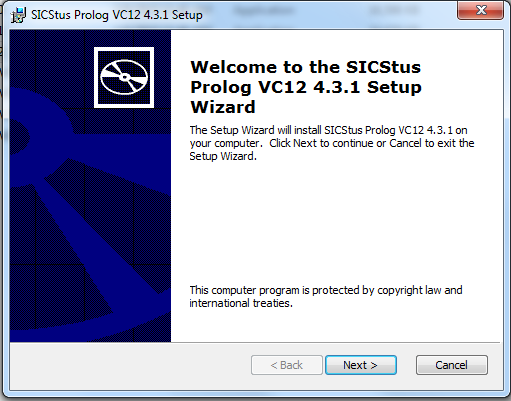 Install SICStus Prolog (32-bit or 64-bit, as desired). Install the latest 64-bit version of Eclipse. Tell Eclipse to install SICStus Prolog IDE from the Software Site at https://www.sics.se/sicstus/update/. Tell SPIDER about the location of SICStus Prolog. Open the SICStus Development perspective is Eclipse. if the above instructions were enough, you should now be ready to develop Prolog code with SPIDER. If not, read on for detailed installation instructions. SPIDER is currently in beta and some manual steps are needed to download, install and setup the necessary programs. The screenshots below are from Eclipse 4.4.1 on Windows 7 but both SICStus and Eclipse look almost the same on other platforms, such as Linux and macOS, and the same or similar steps should be performed on all platforms. Note that the current release of SPIDER requires Eclipse 4.7 (Oxygen) or later. Full-size versions of the screenshots will open in a separate window when the thumbnail is clicked. When you have completed the installation you can continue with the Getting Started link at the overview page. SPIDER is based on Eclipse which in turn uses Java so you need to install and configure the right version of SICStus, Java and Eclipse. This step needs to be done only once. Installing SICStus is the same as in previous releases. SPIDER tend to work best with the latest version of SICStus. SPIDER works with both 32-bit and 64-bit versions of SICStus Prolog, regardless of whether you use a 32-bit or 64-bit version of Eclipe. 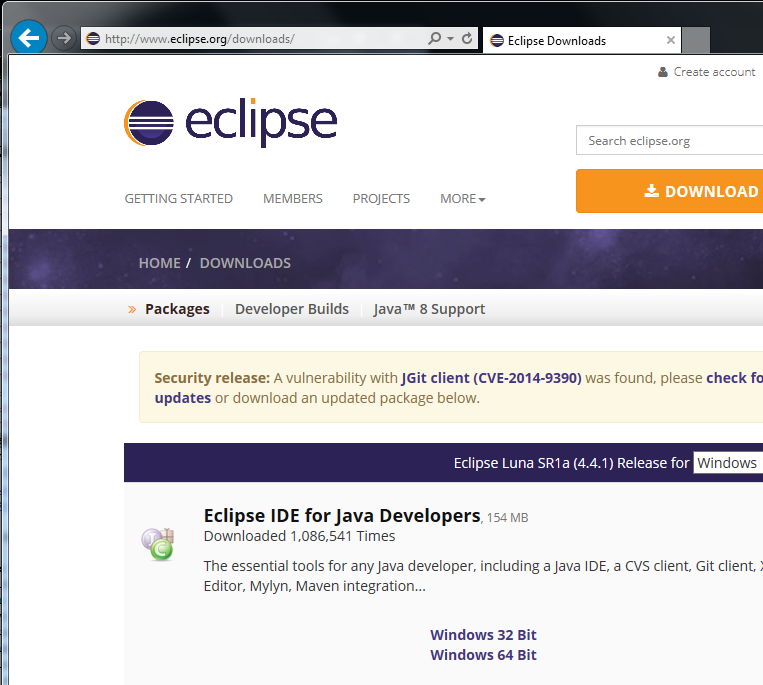 Eclipse does not come with an installer. Instead you need to manually extract the files and, on some platforms, configure Eclipse so it finds the correct version of Java. Install Java 8 (64-bit preferable). You should install a recent version (i.e. Java 8) of Oracle Java. A 64-bit version of Java (and Eclipse) is preferable. Windows only: If you are using Windows you must not use the zip file extractor that comes with Windows (it is broken, at least on Windows Vista). Instead you can use 7-zip or similar tools to unpack the Eclipse zip archive. 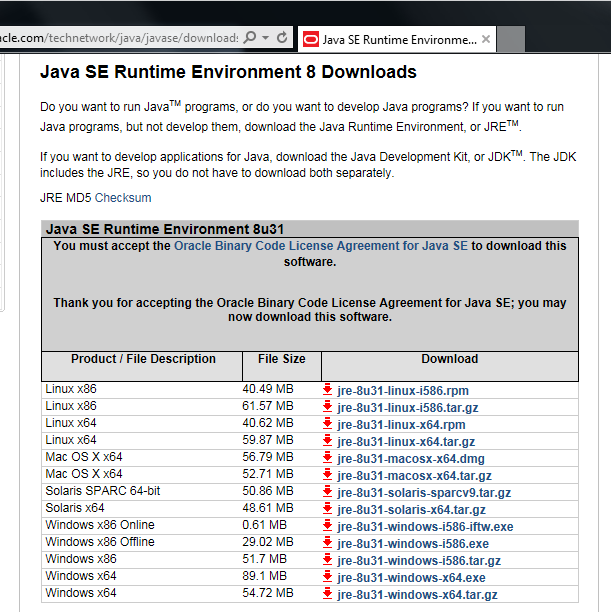 Linux only: If you are using Linux you must ensure that Eclipse is started with the Oracle Java you just installed. See the Eclipse download pages for detailed installation instructions. Installing Eclipse is done by just extracting the Eclipse zip archive (with a working zip utility, see Windows note above). On Linux you may have to perform some additional steps, see Linux note above. 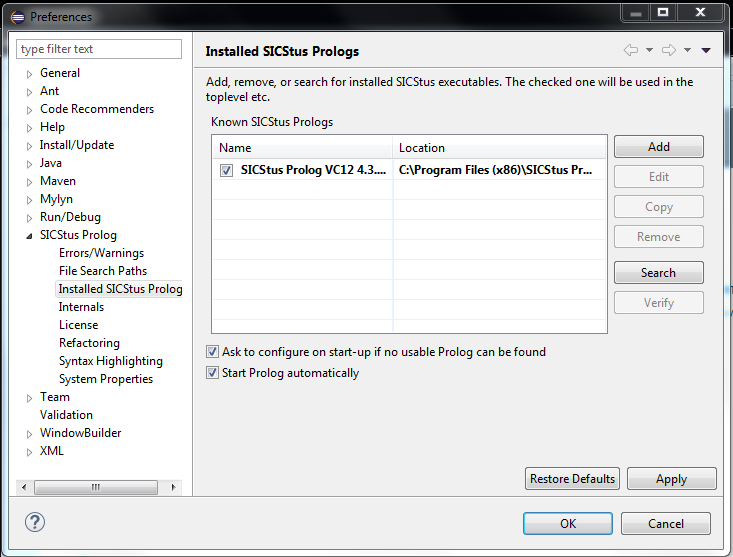 Install the SICStus IDE feature into Eclipse. This is done by telling Eclipse about the SPIDER Software Site, https://www.sics.se/sicstus/update/. See below for details. The final step in setting up SPIDER is to tell it about the location of the SICStus Prolog binaries. If it can not do this automatically, it will prompt you at start-up and offer to open the relevant Settings page. 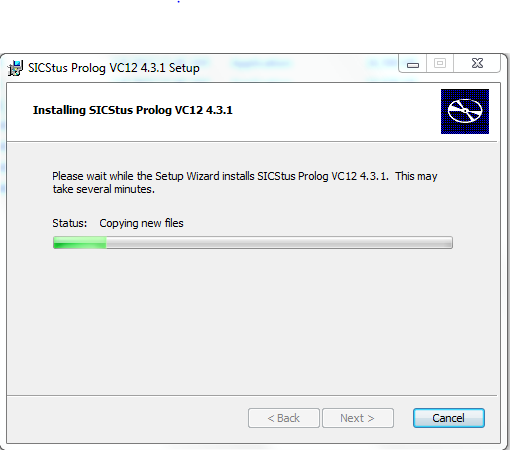 Note: You should change the Settings every time you update SICStus Prolog, so that SPIDER always uses the latest version of SICStus Prolog. We expect to release new versions of SPIDER more often than of SICStus Prolog itself. For this reason it is a good idea to let Eclipse check for updates occasionally. You can check for new versions of SPIDER by selecting "Check for Updates" in the Help menu. It is also possible to tell Eclipse to check for updates automatically. Every time you install a new version of SICStus Prolog you need to change the SPIDER preferences to tell it about the new version. 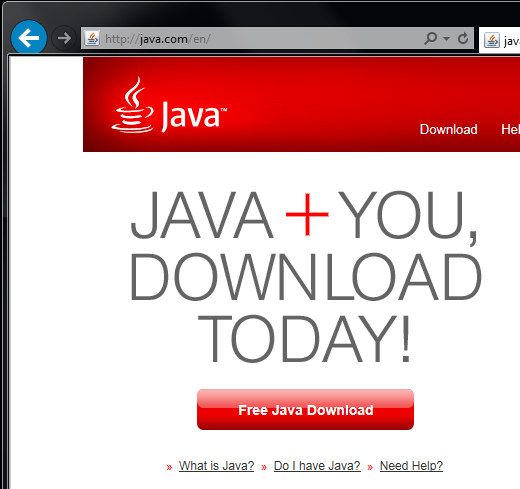 Java can be downloaded and installed from Oracle's Java Site or Oracle's Java Developer Site; a 64-bit version is preferable but is not the default on Windows. Java 8, or later, is required. Eclipse (and SPIDER) should work fine with Java 9. This means that you can not use the ancient Java 6 that Apple provides on macOS, you need to install the Oracle version. Eclipse comes in many configurations. We recommend "Eclipse IDE for Java Developers" which has support for developing Java programs but any variant of Eclipse should work fine. 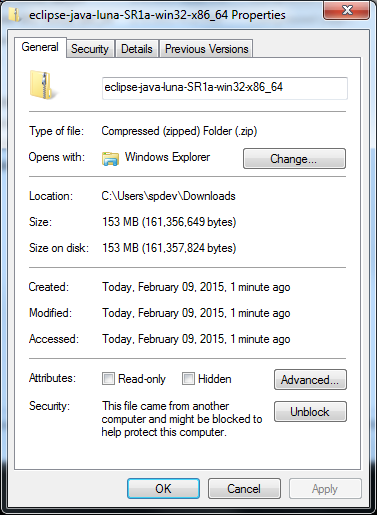 If you installed a 64-bit version of Java (recommended) then you need a 64-bit version of Eclipse. The minimimum supported version of Eclipse is 4.9 (a.k.a. 2018-09) and we recommend to always use the latest version (currently, April 2019, Eclipse 4.11 (a.k.a. 2019-03). We recommend (a 64-bit version of) Eclipse version Eclipse 4.10 (a.k.a. 2018-12) which was released in 2018. It can be downloaded from The Eclipse Site. After downloading do not open the downloaded zip-file just yet. Instead (on Windows) you should first "unblock" the zip file (right click the file, select Properties, click the Unblock button, if present. See the screenshot below.). Finally extract the files somewhere convenient. 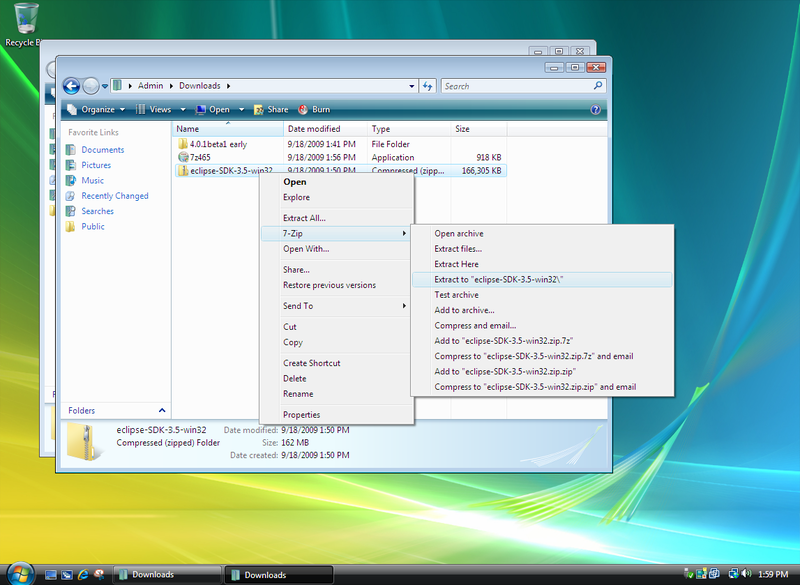 As we have mentioned repeatedly, do not use the Windows built-in zip utility. Instead use some third-party tool, like 7-zip. You may want to create a shortcut on the desktop so that you can more easily start Eclipse, as shown in this screenshot. 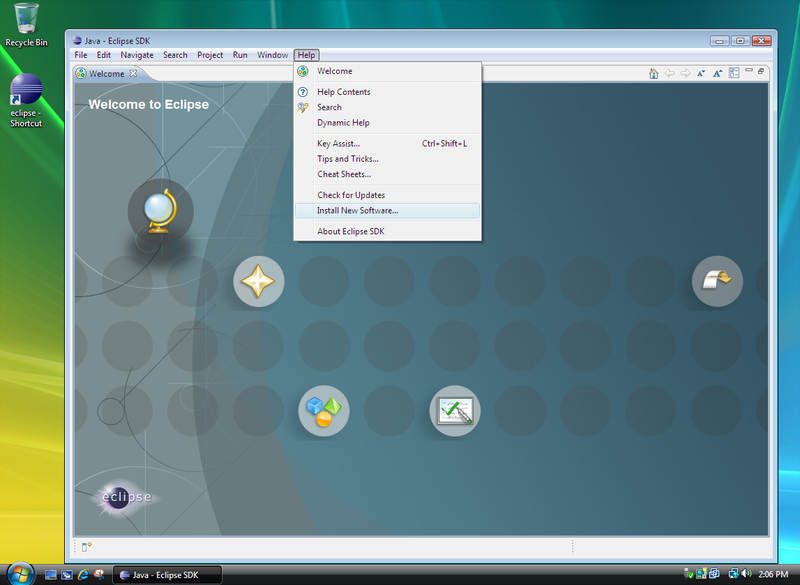 Note: Some of the screenshots are from Eclipse 3.5 and things may look a little different in other versions of Eclipse. 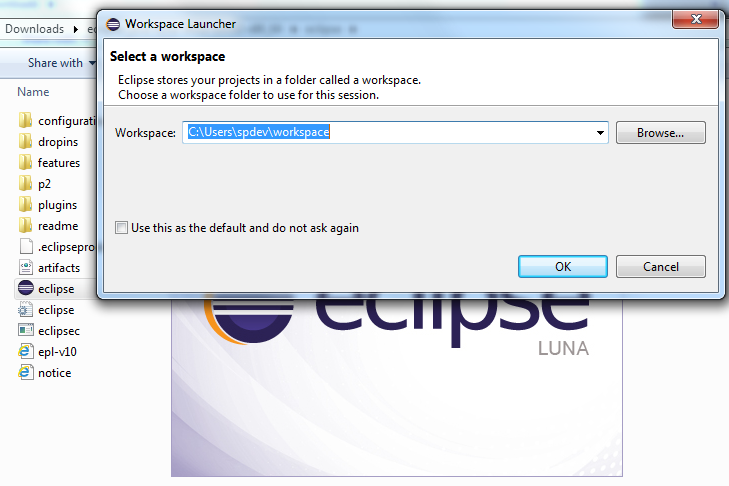 Eclipse will ask about a location for a workspace folder. This is where Eclipse stores all files it creates. You can accept the default. 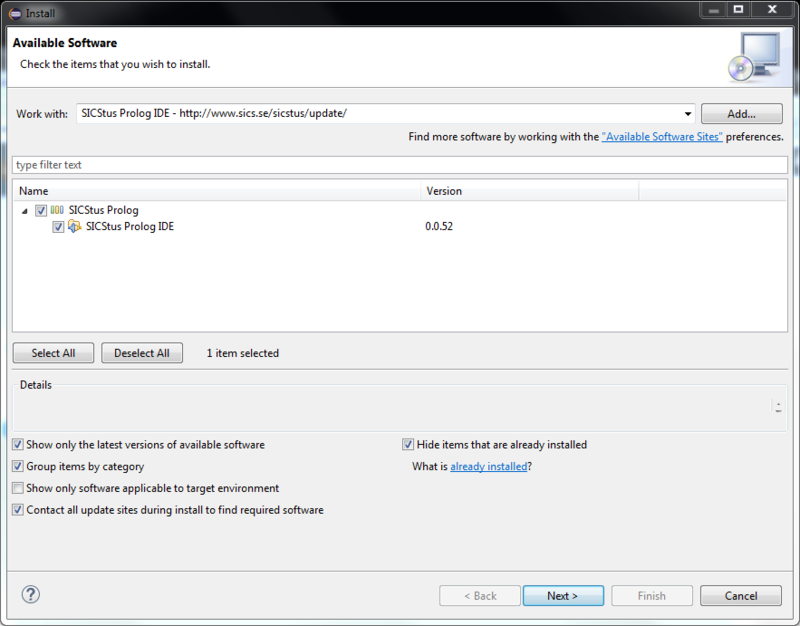 Once you have Eclipse up and running you need to tell it to download and install the SICStus specific features. Eclipse has a concept of "Update Site" which is a web location with special contents. The update site for SPIDER is http://www.sics.se/sicstus/update/. Note that this update site does not contain any interesting human readable contents. Select the "Install New Software" menu item from the Eclipse Help menu. Then fill in the update site address (http://www.sics.se/sicstus/update/) and click the Add button, as shown in the screenshot. You can give the update site a name, e.g. SICStus Prolog IDE. Eclipse should now present a list of the features available at the update site. Select the SICStus IDE Feature and click Next. Accept the license terms and click Finish. Eclipse may warn about “… unsigned content.”, this can safely be ignored in this case. Allow Eclipse to restart itself. There should now be a Prolog-specific entry on the Eclipse Welcome Page (you can open the Welcome Page from the Help menu). You should close the Welcome page. If SPIDER could not automatically select the SICStus Prolog to use, it will prompt you to set things up in the preferences, as shown below. 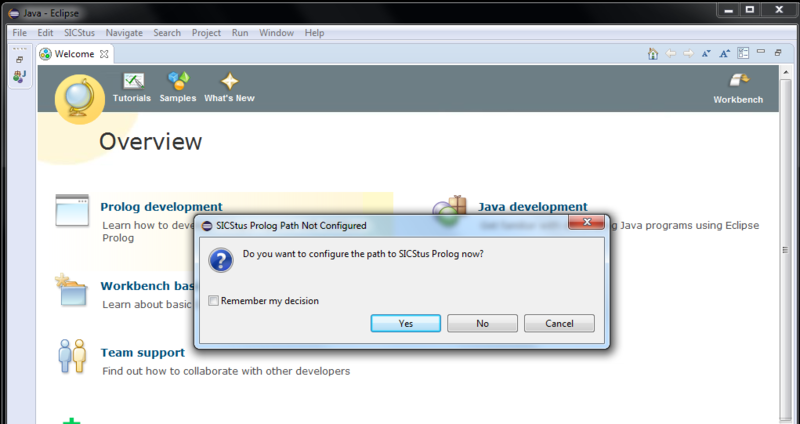 Once SPIDER has been installed into Eclipse you need to tell SPIDER about where the SICStus program, e.g. sicstus.exe is located. Typically SPIDER will prompt you to to open the preferences, but you may also do this manually, e.g. after you have installed a more recent version of SICStus Prolog. The SPIDER preference page "Installed SICStus Prologs" lets you search for available SICStus Prolog installations and select which one to use. 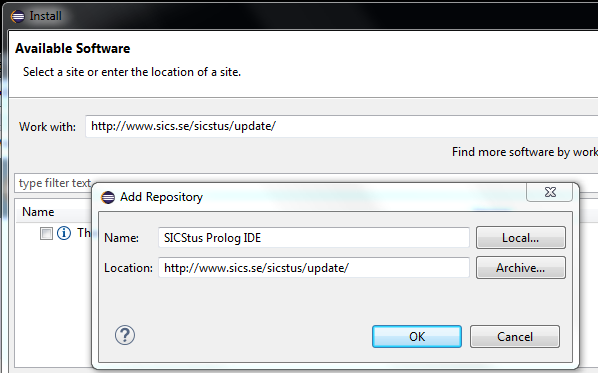 If you installed SICStus Prolog in the default location, it will typically be found automatically. 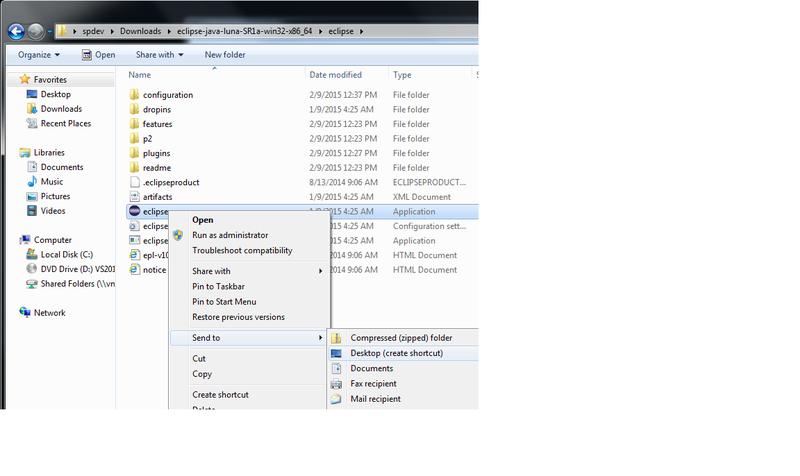 It is also possible to use the Search button to search for all installations within a folder tree on disk. Once you have selected a SICStus executable, and closed the preferences dialog, a "Prolog Reference" project should be created (or updated) automatically. This is a project that refers to the library files that comes with SICStus Prolog. You should not modify this project. Setup of SPIDER is now complete. Continue at Getting Started.